For another fun Thanksgiving dessert idea, check out these candy corn turkey cupcakes. They are also a delight and fun to make. I was born in Maine and fall has always been my favorite time of the year. I used to love watching the leaves change colors and make a spectacular view when the weather was getting colder. 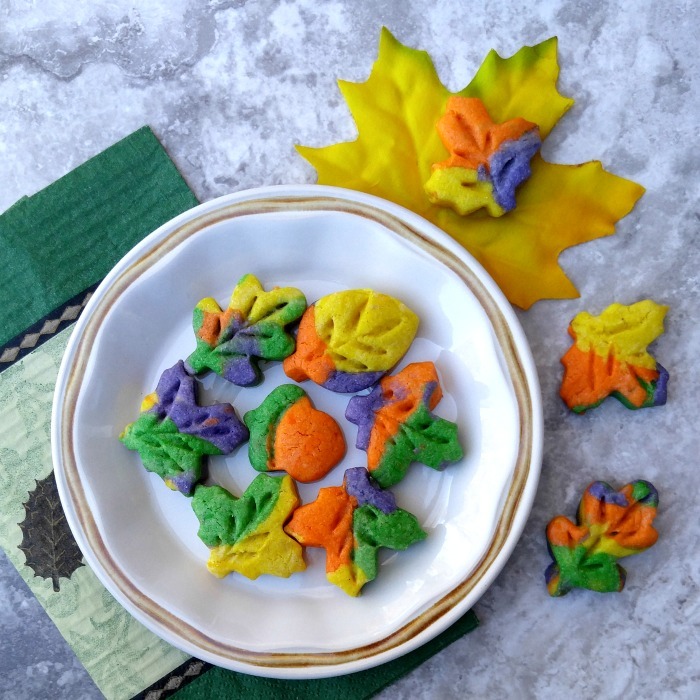 I live in North Carolina now and the colors of the leaves are less bright, but I can bring fall inside to my table with these delicious Autumn Leaf Cookies. I used a basic sugar cookie dough but added a special Thanksgiving touch. Some pumpkin pie spice and a splash of Pumpkin Pie Spice flavored Coffee Creamer added a delicate pumpkin pie flavor to the cookies. Just looking at this plate of cookies makes me think of the lovely display of leaves in Maine and makes me very nostalgic for their cold fall weather. If you have never seen the leaves in the fall in the Northeast, you should definitely take a trip to see them. They are amazingly beautiful! 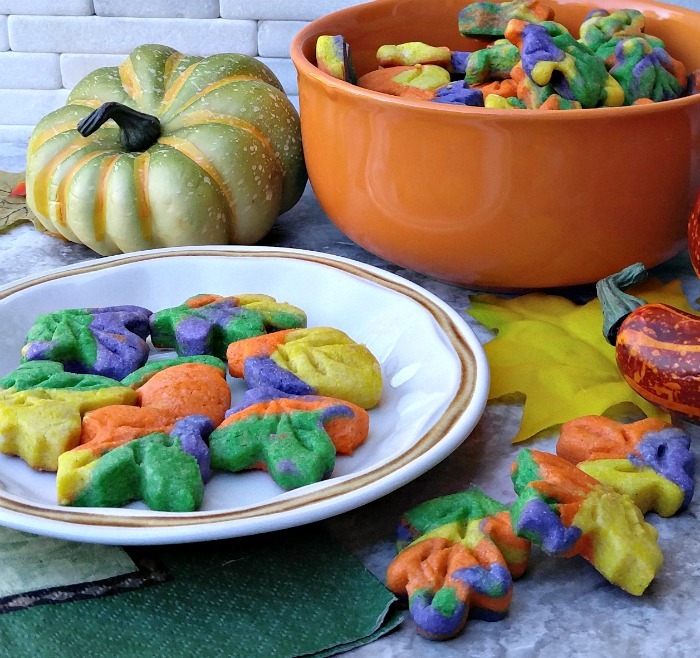 It’s time to make these Thanksgiving Autumn Leaf Cookies. 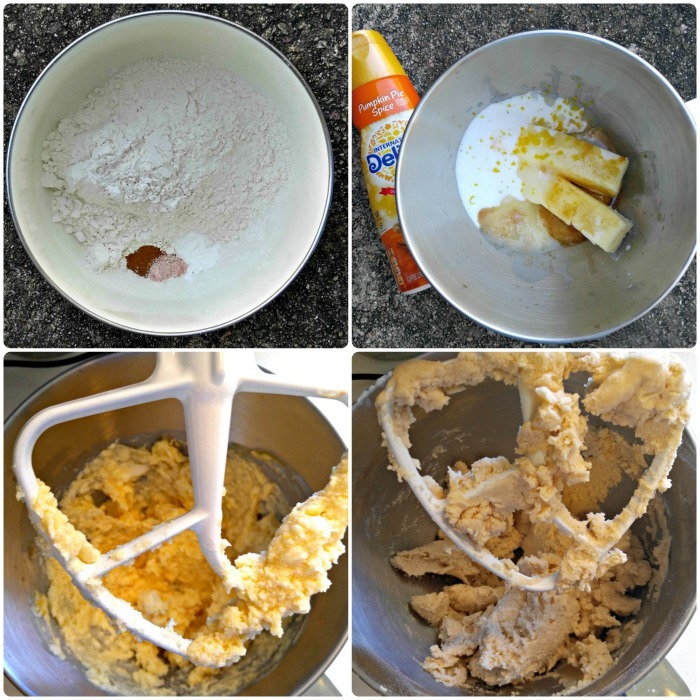 To make your cookies, start by whisking your dry ingredients and then mixing the butter, sugar, spice, vanilla extract, coffee creamer and lemon zest in a stand mixer. Add the dry ingredients to make a stiff dough. 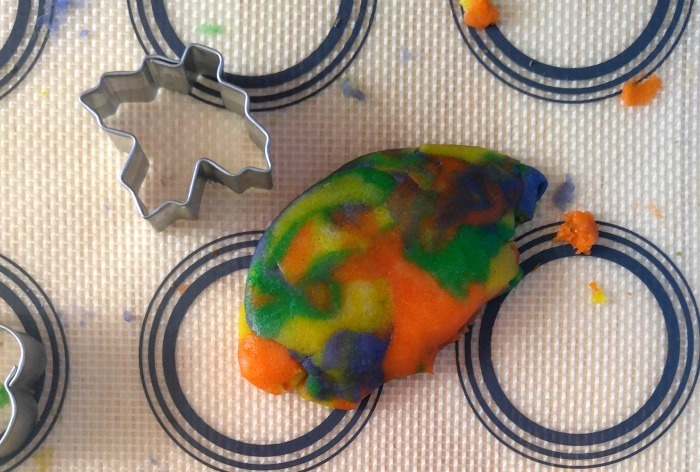 Wrap the colored dough with plastic wrap and put in the fridge for an hour to make it easier to work with. Take out the dough and pinch of chunks of it and piece it together on a silicone baking mat. 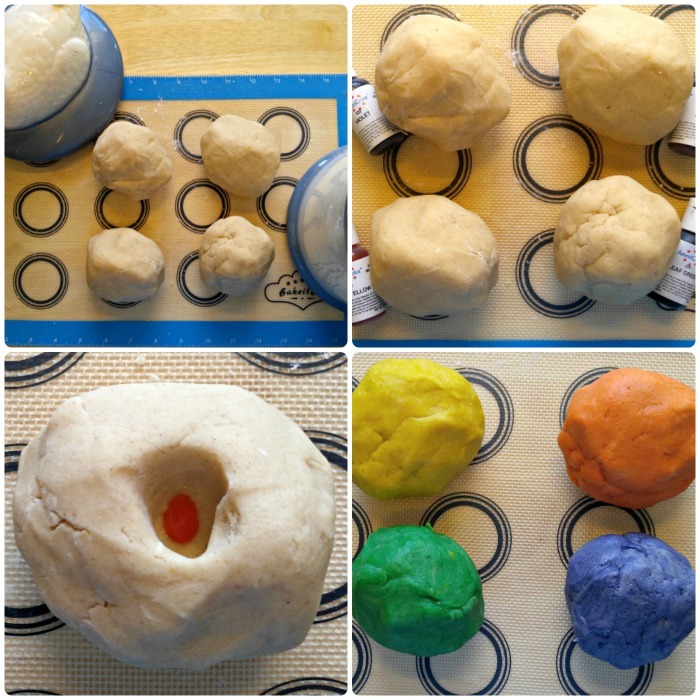 Roll the colored dough to about 3/8″ thick with a floured rolling pin. 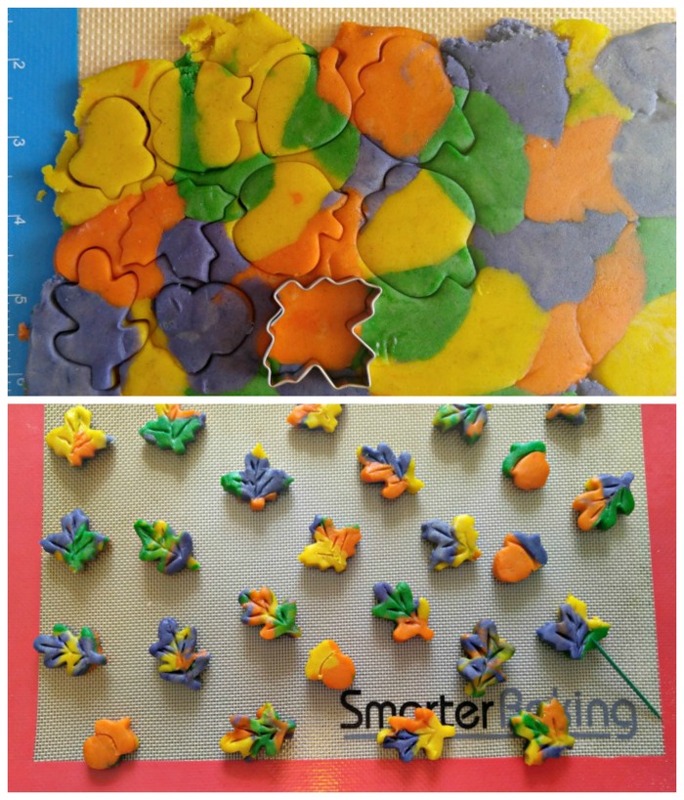 I used some Wilton Leaf Shaped Cookie Cutters that were about 1 1/2″ in size. 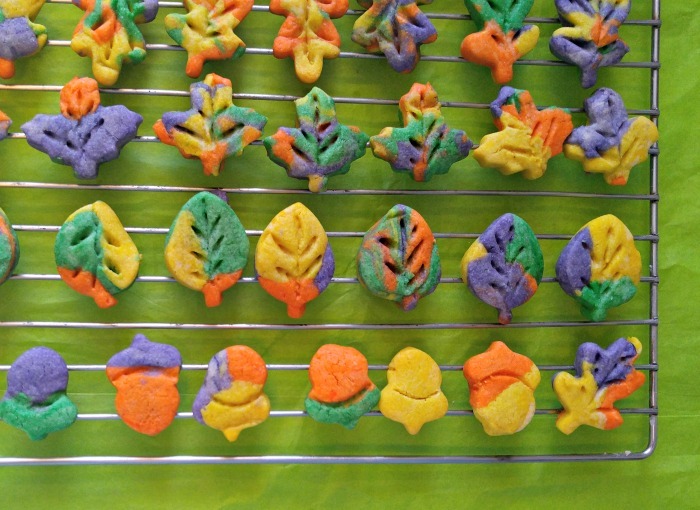 I had three different leaf designs as well as a 1″ acorn and managed to get 100 cookies out of the dough. I used toothpicks to draw veins in the leaves for more effect. As you cut the cookies, you will end up with extra dough. Just make it into small balls, flatten and cut to give even more of a leaf mosaic look to the cookies. Bake in the preheated oven for 7 minutes and then place on a wire rack to cool. Time to Taste this Thanksgiving Cookie Recipe! This Thanksgiving cookie recipe has a delicate texture and light hint of pumpkin pie spice. I LOVE the size of them. It means I can eat 2 (or 4 or 5!) of them without breaking the calorie bank. 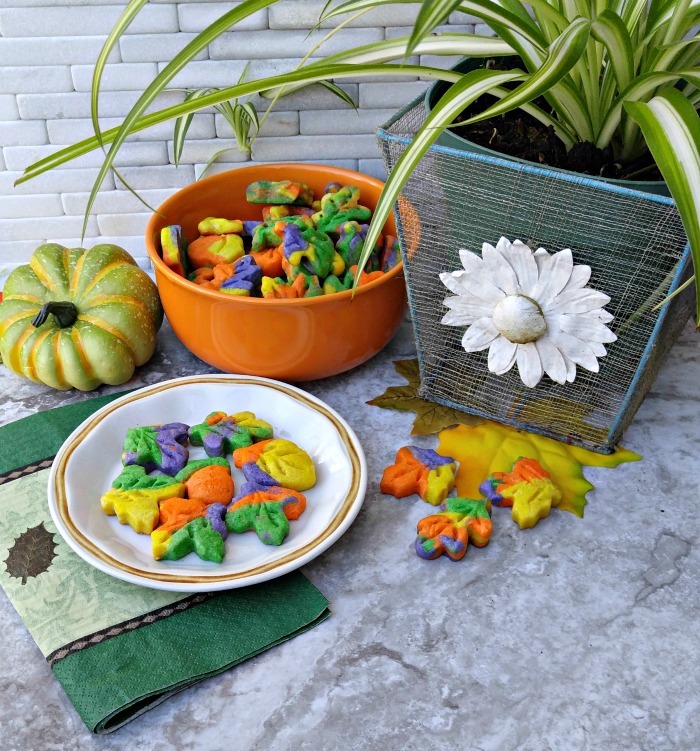 Place a bowl of these autumn leaf cookies on a party table with some festive fall decor items for a pretty tablescape. There is nothing quite like a batch of these Thanksgiving Autumn Leaf Cookies this time of the year. Even if your leaves are not falling and it’s not time to have a fire in the fireplace, you will get in the fall mood with these delightful little sweet treats. This Thanksgiving Cookie Recipe is the prefect treat to take to your child’s school party and also fun to share at your annual cookie swap. I bet you will hear lots of people saying “they are too pretty to eat! But don’t let that keep you away from them. The taste is just amazing! Are you all set for the upcoming holidays? What is your favorite festive sweet treat to share with your friends and family? Please share your ideas below in the comments. For more Thanksgiving inspiration, be sure to check out my Let’s Give Thanks Pinterest Board. Would you like a reminder of this recipe for Thanksgiving leaf cookies? Just pin this image to one of your Thanksgiving boards on Pinterest. 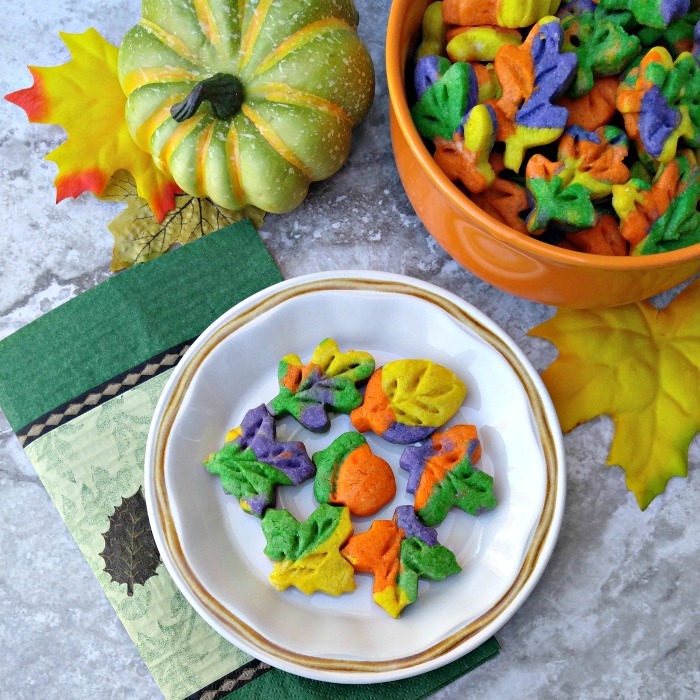 Make these autumn leaf cookies to bring color & the feel of fall to your holiday table. Pumpkin spice makes this Thanksgiving Cookie recipe very seasonal. Whisk together the flour, baking powder, pumpkin pie spice, and sea salt and set aside. Add the sugar, butter, vanilla extract, lemon zest and pumpkin pie spice coffee creamer to the bowl of a stand mixer. Mix well to combine. Gradually add in the dry ingredients to make a stiff dough. Separate the dough into four evenly sized balls. Add the gel food coloring to each ball of dough and mix well with a paddle attachment. Be sure to wash the bowl and paddle between each color so that the don't change the color you want them to be. 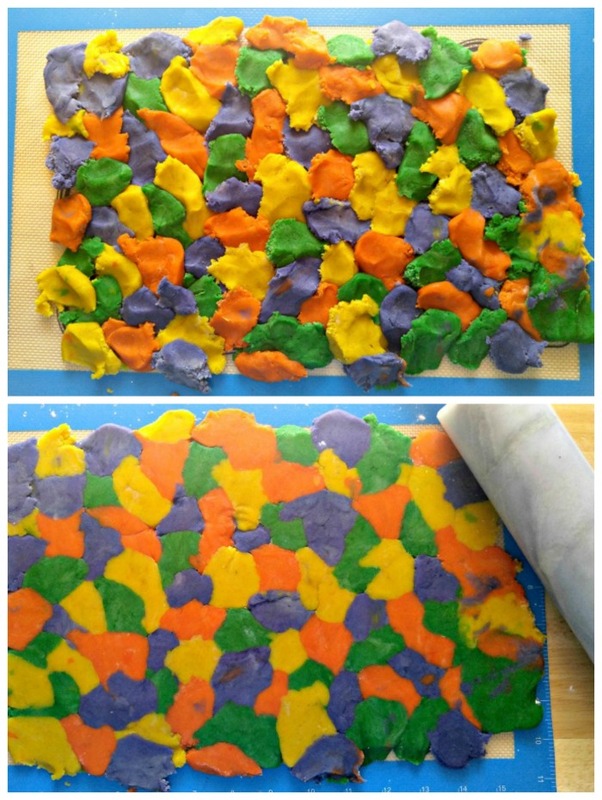 Cover the colored dough with plastic wrap and refrigerate for one hour. Preheat the oven to 375º degrees. Use small leaf cookie cutters to cut the dough into leaves and use a toothpick to draw veins in the leaves.